You’ll notice that this newsletter makes mention of our Board Chairman, Matthew Popham, who works tirelessly in the charitable sector and is an all-round great bloke. This year, he is doing the unimaginable – a marathon in Antarctica! All to raise funds for Telethon as part of the Telethon Adventurers. I encourage you to read about Matt and then also, the way that we, as a Telethon Beneficiary, will be using the funding that we received from this fantastic organisation. On other matters, the Inclusion WA Quiz Night is growing ever closer and I have been told that the tables are almost booked out – if you would like to book a table for this fantastic event, please get in touch soon. It’s that time again! 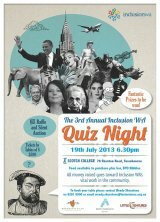 The Inclusion WA Quiz Night is back and it’s bigger and better than ever! This November, a team of intrepid adventurers will take on a marathon in Antarctica – all for Telethon and led by Inclusion WA’s Board Chairman, Matt Popham. Inclusion WA is thrilled to again be a Telethon Beneficiary. Inclusion WA has put together a huge list of links to help you get involved in the community. If you would like to get involved in a recreational or social group but don't know where to start then have a look at the links and attached documents on this page for some ideas on where to find things in your community and how to get involved. 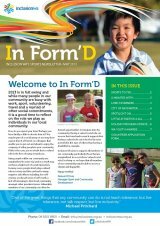 The latest edition of In Form’d is here - Inclusion WA’s Sports Newsletter!